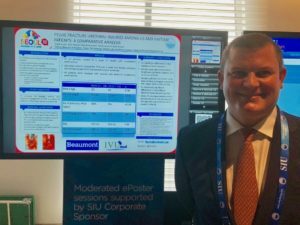 Dr. Frank Burks presenting his great work in Haiti which compares favorably with his US results, at the International Urological Society (SIU) annual meeting in Seoul, South Korea. Dr. Lanctin and Dr. Desir test donated equipment on arrival. 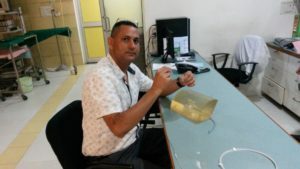 Several patients were then evaluated including some with vesicovaginal fistula and some men with urethral stricture disease. 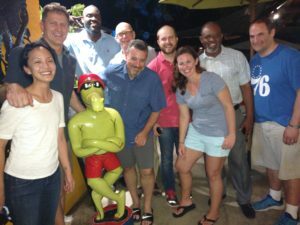 The day ended with a dinner hosted by Dr. Desir and Dr. Dube at the LaKay. 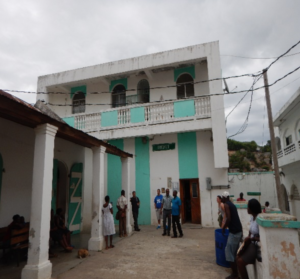 On Day 2 our team along with our Haitian colleagues evaluated additional patients with fistulae and urethral obstruction. Both residents and staff physicians from the US and Haiti participated in this hands on interactive session. 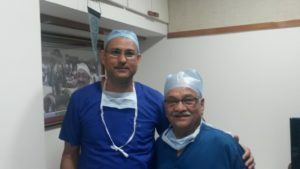 Preparation in the operating room occurred as well for upcoming surgeries to begin in the morning. 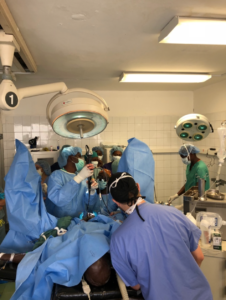 Patients were then jointly reviewed and the physicians created a plan for the operations to be accomplished by Haitian surgeons assisted by US surgeons. In addition, the remainder of our team arrived. 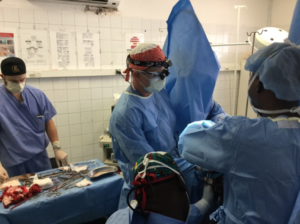 This included Dr. Bill Cleary, Lura Spears CRNA and Kelly Joe Gabel who will assist in teaching of the anesthesia providers from Haiti. 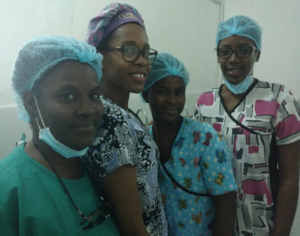 The focus of the trip is in expanding the knowledge and skills of our Haitian colleagues in both urology and anesthesia. On Day 3 through 6 the team assisted the Haitian urologists and anesthetists in performing complex bladder fistula repairs and complex urethral repairs not only improving patients’ quality of life but developing local team operative skills so that these repairs are available locally through native surgeons and under the anesthetic care of local providers in the future. 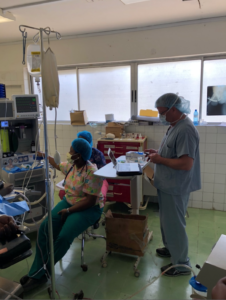 US resident physicians Dr Cheeps Cairnes and Dr Sabine Nguyen and Statia Smith were critical to the success of the workshop working with local operating room staff including circulating nurses, surgical techs and recovery room staff to build efficient team work. The skills of the local providers were excellant but their outcomes and future success will depend on continued infrastructure support including equipment, facilities and operations. 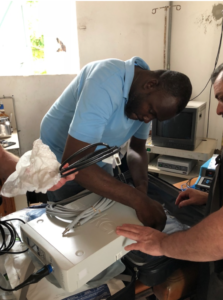 The equipment delivered by Dr Lanctin was used throughout the week including the Storz endourology equipment, the Stryker Camera, the bovie machine, suture and equipment provided by Project Haiti and the flexible cystoscope. 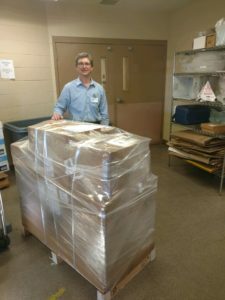 An additional future needs assessment was carried out with the assistance of local urologists, anesthesiologists, residents and administrators. 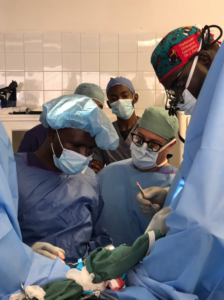 Left: Dr. Tellusme Jolius, a Haitian urology resident, performs a urethral repair with his attending, Dr. Desir Jory and calm US urologist Dr. Joe Costa, as residents and medical students look on. 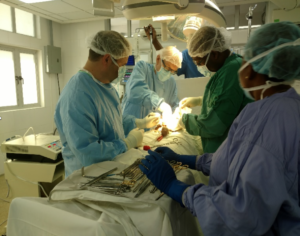 Right: Dr. Bill Cleary teaching Haitian anesthesia students and staff. Top: Dr. Joe Costa delivers state of the art lecture to staff, residents and medical students. 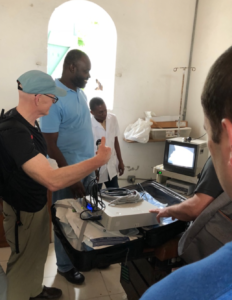 Bottom: Culmination of trip when Haitian staff urologist Dr. Desir leads Haitian resident urologist through case with Haitian anesthesia students and staff providing anesthesia as Dr. Costa looks on. 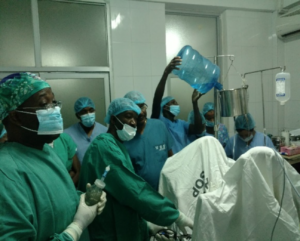 Left: Dr. Joe Babiarz directs Haitian Urologists while performing a complex vesicovaginal fistula repair. 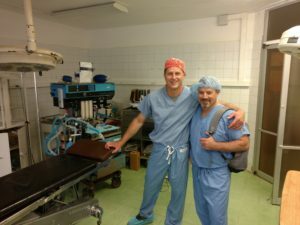 Medical College of Georgia (IVU Med sponsored resident) Chip Carnes in background assists with teaching surgical assist/tech skills. 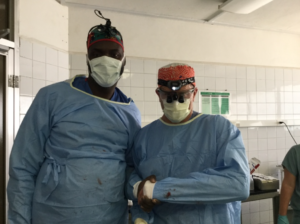 Right: Dr. Joe Babiarz and Dr. Jory Desir after another successful case. I talked to Junelle and she is happy for the surgery.She is going to have her smile back as she was depressive after a disaster like this in her life. 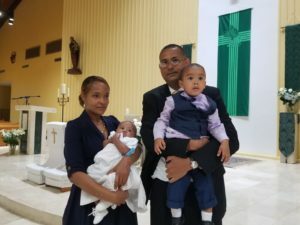 She has been admitted in a teaching hospital and stayed in for more than 20 hours in obstructive labor and she lost the baby – she had nerve compression – Finally she has been referred to another hospital because there were no materials for her C section and her Hysterectomy done because of uterine rupture. Many thanks because what you did is priceless – May God continue to bless you all. Best regards to you and your family Guys.